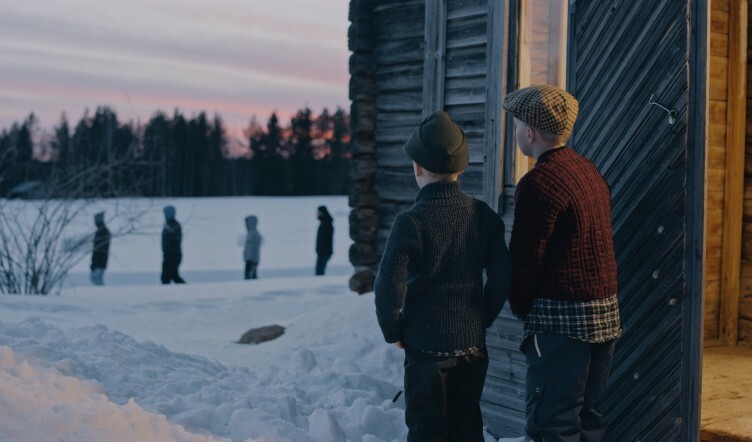 Minna Rainio & Mark Roberts awarded 8th Turku Biennial prize for touching and humane film "They Came in Crowded Boats and Trains"
Added on February 13, 2015 by Mark Roberts. Listen to Minna Rainio talking about the mini-retrospective of works "Our Land" showing at Luleå Culture House. Added on October 15, 2014 by Mark Roberts. We're almost finished editing the new works for the Witness show at Peri. Maamme featured prominently in Kaleva's review of "What's Up North?" at the Northern Photographic Center, Oulu. Turku Sanomat looks forward to "Witness"
Added on September 18, 2014 by Mark Roberts. Annamari Vänskä wrote a nice piece in Turun Sanomat, picking Witness out as one of three exhibitions in Turku to look forward to in November. Added on March 12, 2014 by Mark Roberts. Rainio & Roberts will present their work at the IHME festival in Helsinki during the IHME Marathon on Sunday 6.4.2014. Other speakers include Outi Peski, Marja Helander, Adel Abidin, Jaakko Heikkilä, Pekka Niskanen, Pia LIndman, Pekka Kainulainen, Diego Bruno, and Johanna Lecklin. The IHME Festival runs from 4–6.4.2104 at Vanha, Helsinki. Added on January 9, 2013 by Mark Roberts. Added on March 15, 2008 by Mark Roberts. Borderlives - Contemporary Art from Helsinki, St. Petersburg and Tallinn is an up-to-date inquiry into the artistic, social and mental situation of this northernmost region of art in Europe. It concentrates on artists, who independently and accurately reflect the epochal upheavals of recent years. At the center of this artistic discussion are physical and mental border experiences. Added on January 5, 2008 by Mark Roberts. Both Angles of Incidence and Rajamailla (Borderlands) will be shown at Rovaniemi Art Museum, Rovaniemi, Finland, from 23.1 - 9.3.2008. A selection of individual (solo) works will also be exhibited. Mark Roberts is showing two new video video works Foreign Apples and Terra Incognita from the series "Scenographs". Each work in the series attempts to condense a theme or issue into a single scene. Foreign Apples looks at the presence of nationalism in the everyday, while Terra Incognita examines the difficulty of making life-changing decisions in a mundane world. Added on November 2, 2006 by Mark Roberts. Angles of Incidence will receive its premiere and be exhibited as part of the fifth Finnish Photography Triennale at Salo Art Museum, 3.11.2006 - 7.1.2007. The fifth Finnish Photography Triennial is organized in co-operation by the Union of Artist Photographers together with the Salo Art Museum and will be open from November 3rd 2006 to January 7th 2007 at Salo Art Museum. The show is curated by Raakel Kuukka, photographic artist, who has selected 17 artists to show at the triennial. The main themes of The fifth Finnish Photography Triennial are the human being and the community. The title of the exhibition, Talvimaa - Winterland, is a geographically undefined area in the Northern hemisphere, but it is also a state of mind that can be interpreted and that in turn affects our interpretations. Semantically speaking, the title embraces at the same time borders and the lack of them, while looking also at the notions of local and global. The artists participating in the show reform, expand and question the associations triggered by the title. The exhibition is a proof of the diversity of the working methods of contemporary photographers. The works reflect the broad range of stylistic choices of the photographers, from realism to surrealism, giving fresh life to the stereotypes of landscape and portrait photography. The variety of media employed by the photographic artists today, made it natural to include also video works in the show. The artists included in the triennial are: Pasi Autio, Ilkka Halso, Martti Jämsä, Janne Lehtinen, Jouko Lehtola, Susanna Majuri, Aada Niilola, Hannu Pakarinen, Marja Pirilä & Petri Nuutinen, Minna Rainio & Mark Roberts, Catarina Ryöppy, Sanna Sarva, Marjukka Vainio, Hanna Weselius and Maria Ylikoski. A catalogue of the show, both in Finnish and English, will be published in co-operation with publishing house Musta Taide. The catalogue, with its artist presentations, and articles by the photographer Hanna Weselius, museum director Laura Luostarinen and curator Raakel Kuukka, will be an up-to-date overview of Finnish contemporary photography at its best. Graphic desingner Anne-Mari Ahonen is responsible for the layout of the catalogue and other printed materials. INFORMATION Museum director Laura Luostarinen, Salo Art Museum Veturitalli, Mariankatu 14, FI-24240 Salo, Opening hours: Tue-Fri 10-18, Sat 11-17, Sun 11-18. Admission 3 e, pensioners 2 e, students 1 e, children under 18 free. www.salontaidemuseo.fi. Added on April 4, 2006 by Mark Roberts. “A picture is worth a thousand words” Minna Rainio’s and Mark Roberts’ joint exhibition explores the relationships between images and texts – the areas where words and images mix, interact and create new meanings. Minna Rainio’s series “Subtitled Scenes” is part of an ongoing process in which she films scenes from her everyday life. These moments might be seemingly insignificant and ordinary, yet they are also extraordinary and form the pattern of a life. During these ordinary moments when nothing much happens, we are thinking and trying to make sense of our lives, the world and our place in it. The work consists of a series of film-stills that she has taken from the films and to which she has added subtitles. The subtitles allow her to look at her experience from outside, as if a “foreigner” to herself. The relationship between the subtitle and the image also reflects the connection between experience and articulation, and the space between emotion and language. Roberts’ works for the exhibition explore this concept of the image as language. Using several different textual methods he disturbs the familiarity of the image, and challenges the viewer’s relationship with the photograph. His works are an attempt to ‘read between the lines’ of the image, suggesting that although we might speak the language of the photograph, we don’t necessarily always understand what is being said. Added on August 25, 2005 by Mark Roberts. Rajamailla is showing as part of the Barents Art Triennale in Kirkenes, Norway. The exhibition features Maja Bajevic & Emanuel Licha, Ursula Biemann and Angela Sanders, Isaac Julien, Roman Ondak, Minna Rainio & Mark Roberts, Oliver Ressler & Martin Krenn and Stephen Willats. Curator: Jan-Erik Lundstøm. Exhibits from the community project of Laura Anderson Barbata, Geir Tore Holm, Marja Helander, Lena Stenberg. Border Dialogues – The Barents Art Triennial, is an international art project, which aims to mediate and explore questions and responses, experiences and feelings related to the concept of borders. The project is organised in different phases with activities such as exhibitions, community projects, texts, talks, travels, workshops and events or festivals, held in different places throughout the period of mid 2005 to mid 2006. Kirkenes is located in the northeast of Norway on the border between Finland and Russia, in the Barents Region. The Barents Region includes the northernmost countries of Sweden, Finland and Norway and Northwest of Russia. Within this region there are a huge amount of structures, languages and cultures.The project aims to bring to light knowledge about borders and boundaries, with international art as a source, to people in the Barents region. 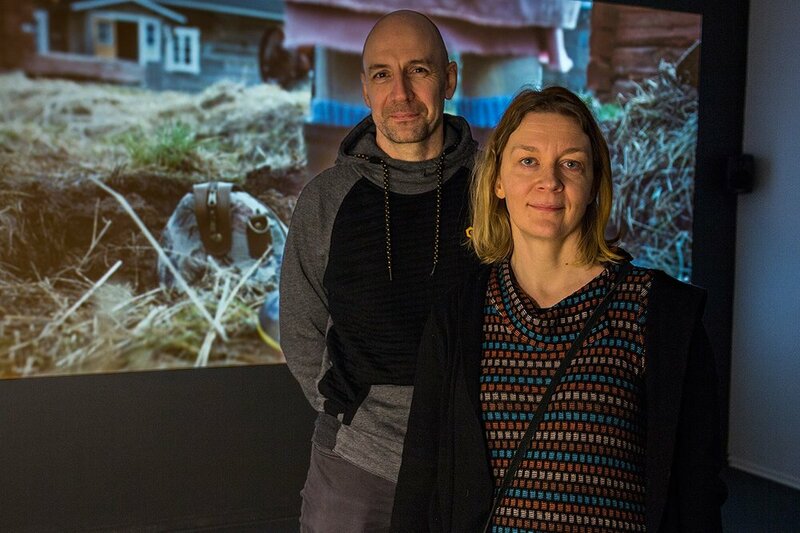 At the same time, the project also aims to connect the particular context of the Barents region and its artists to other artists, places and contexts outside the region. Taking an international art focus to focus on border issues and to discuss the theme of "indigenous people, national states and borders”, the triennial aimed to expose and make visible the physical, social and mental structures that define movements and thoughts of people. It studied different art strategies as well as the possible shape of a Barents Triennial. It consisted of art exhibitions, journeys, events, community art, artistic research, an environmental art workshop and a seminar, held in different places throughout the period of mid 2005 to mid 2006. The history of the borders of this area, consequences of the nation building and indigenous peoples’ history, were important backdrops for this project. Through the project, organisers connected four places with similar histories on each side of the borders – Kirkenes (NO) and Murmansk (RU), the villages Neiden (NO) and Lovozero (RU). By inviting artists to work in the communities ahead of the opening event, organisers encouraged dialogues between the artists and people locally. The audience was introduced to excerpts from different dialogues, visually or verbally expressed. Interesting exhibitions reflecting the topics were on display. An explosive sound event took place in Murmansk, with the most interesting electronic musicians from Murmansk, Mombus and Test Pressing, together with ADD from Petrozavodsk and the Vienna-based artists Franz Pomassl and Anna Ceeh. The exhibition Next Door in Kirkenes consisted of seven projects and presentations of artistic practices that engaged, narrated and explored issues of transgression, exile, migration, community and self, all performed and enacted through the presence of real and imaginary borders. Added on May 11, 2005 by Mark Roberts. Rajamailla (Borderlands) is showing in the Leaps of Faith exhibition in Nicosia, curated by Katerina Gregos and Erden Kosova, 13 - 29.5.2005. Leaps of Faith is an international exhibition and multi-disciplinary arts project that will be held in Cyprus in May 2005 and will mark the first time in 30 years that a part of the UN controlled Green Line (buffer zone) dividing the island is opened up for use in an international event. The Theme of the Project This project aims to animate and activate public spaces, buildings and sites in the divided city of Nicosia and the war-ravaged Green Line, partitioning the capital of Cyprus, through an international public arts event. The purpose of the project is to reinforce communication and exchange but also to encourage an alternative discourse which diverges from the political perspective that has been largely limited to the internal issues surrounding the perennial Cyprus Problem. This means exploring the parameters of the islands unique geographic position being poised, as it is, between three continents, and situated within a region marked by ongoing political conflicts. At the same time, it aims to shift its attention to a host of existing socio-cultural issues and problems that have been marginalised as a result of the realpolitik such as gender and class issues, minority rights, the ill effects of tourism, de-regulated urban expansion, skewed notions of development and economic and sexual exploitation of immigrants. Rather than focusing solely on issues of opposition, division and closure the exhibition and its parallel events hope to focus on the possibilities for such openings political and cultural co-habitation, communication, and social change, as a way of imagining a peaceful and hopeful future for the island. Venues For more than 30 years, the UN controlled buffer zone, with its shelled out homes and shops left in ruins since the armed conflict in 1974, has run through the heart of Nicosia, a visually dramatic and alarming reminder of the hostilities that split the island and prevented Cypriots from interacting with each other until April 2003. The exhibition will be held in the charged site of the so-called Green Line in the abandoned buildings and on the street - and will spill into public spaces, buildings and venues on both sides of the divided city, thus calling into question the function of public space as well as of boundaries, visible and invisible, of the past and of the future. Structure Leaps of Faith will include a main exhibition organized by its curatorial team, which will feature 22 international and Cypriot artists whose work has conveyed an understanding of the notion of a contested territory, is engaged with a strong sense of social responsibility, operates site-specifically, and is in a position to be able to highlight the particular physiognomy of the city of Nicosia. The exhibition will be comprised of new, site specific works, which have been based on local research and communication. A series of film screenings, lectures, artists workshops/talks and a conference have been planned to coincide with the exhibition. The artists workshops and talks are being organized by Noise of Coincidence, a Cypriot collaborative artists group. The film screenings will take place at the Weaving Mill in South Nicosia, the Goethe Institut in the UN buffer zone and Arabahmet Cultural Centre in North Nicosia. Sponsors Leaps of Faith is supported by the Open Society Institute, the European Cultural Foundation, the Chrest Foundation, the United Nations Bi-communal Development Programme, which is funded by UNDP and USAID, and executed by UNOPS. Additional support has been received by the Mondriaan Foundation, FRAME (The Finnish Fund for Art Exchange), the British Council, Technical Chamber of Cyprus (ETEK), The Royal Netherlands Embassy, Cyprus Mail, Yeni Düzen and Politis newspapers, Vakiflar Bank, Goethe-Zentrum Nicosia and the Pharos Trust. Added on September 11, 2004 by Mark Roberts. Rajamailla (Borderlands) will be shown along with a new selection of photographs of the border area in an exhibition at Aine Art Museum in Tornio, Finland, 10.9 - 3.10.2004. Rainio and Roberts will also show some of their individual works. Added on January 15, 2004 by Mark Roberts. 20 artists from Estonia, Latvia, Lithuania, Finland and Russia discuss their relationship with the near past and, in particular, its reflections on the present day in an exhibition produced by Kiasma. What will the future bring? What is the tradition that provides a foundation to build on and with whom to identify oneself? From the Finnish perspective, it is time to think of our Eastern selves and its visible impact on our culture.